Regular expression also known as regex / regexp has many uses in web programming, it’s powerful yet it can make you a headache. Fortunately, there are many useful online regex tools to test, build and generate valid regular expression faster and easier. Regex is a pattern of a special character or text string to search for the pattern specified in the text and pattern matching with string. Regex is widely-used for web scraping, search and replace, data processing and data validation. In web programming, especially for data mining, a regex can help you collect a very specific data from a web pages, you can also extract HTML data without having to copy and paste one by one to get entire data such as; email address, phone number, URL pattern address and more. If you are new to regular expression, you might want to try to use this regex tools we provide in this post. You’ll find a list of regex tester, builder and generator along with great features such as real-time regex editor, cheat sheet, examples and syntax highlighter which will allow you to create regex patterns you need. I hope this tools is useful and helps you to learn regular expression easily. RegExr is a great online regex tester and builder that you can use to learn Regular Expressions. RegExr also provide cheatsheet and examples to help you create your own regex. 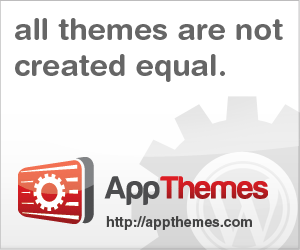 You can undo, get results update in real-time and save your work. RegExr is community-based website, so you can share and view the regular expression examples / patterns in library and help each other. Regex101 is a PCRE (Perl Compatible Regular Expressions) debugger with real-time regex tester and library. They regex editor will highlight your regex pattern, detect errors and display detailed match information on the fly. 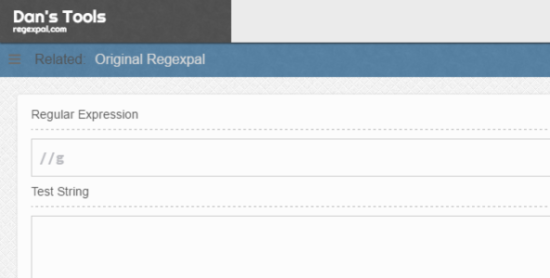 RegexPal is a free online / real-time regex syntax highlighting and tester. The syntax highlighting is more complex than you might expect, as it strives to be aware of all aspects of ECMA-262 3rd Edition regex syntax, and some browser-specific bugs, features, and limitations. RegExLib is a community website and library of regular expressions, it’s useful place to learn and and create a regular expression for your projects, you can add regex, edit, rate, and test regular expressions. 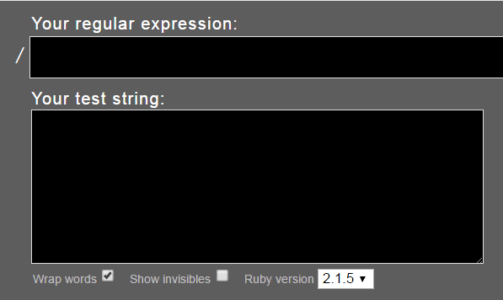 Rubular is an online Ruby regular expression editor and tester. It’s a handy way to test regular expressions as you write them, you’ll write better code, be more productive, and enjoy programming more. 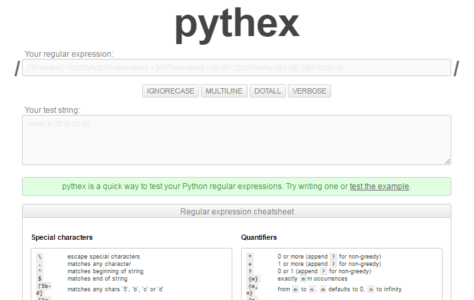 Pythex is a simple regex tester for Python with live-result editor and cheatsheet. 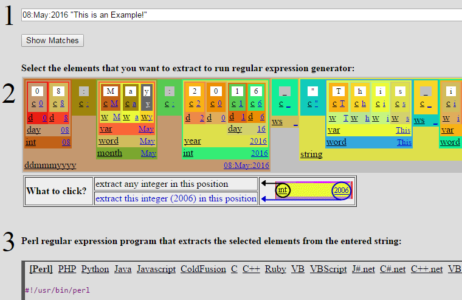 txt2re is free graphical regex generator that you can use to generates corresponding regular expressions. txt2re acts as a regular expression generator, you start off with the string that you want to search. 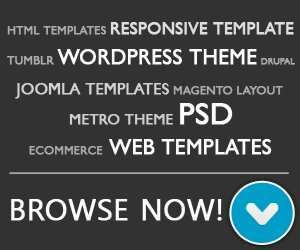 You paste this into the site, click submit and the site finds recognisable patterns in your string. You then select the patterns that you are interested in and it writes a fully fledged program that extracts those patterns from that string.